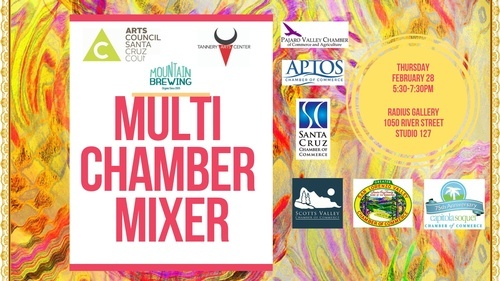 All Chambers from Santa Cruz County are hosting a business networking mixer in the Radius Gallery Studio 127 at the Tannery Arts Center. The Tannery Arts Center is a first-in-the-nation arts community that provides a sustainable, accessible and vibrant home for the arts in Santa Cruz County. Mountain Brewery will be pouring, hors d’oeuvres and non-alcoholic beverages will be served. A Raffle will take place with gift baskets donated from each Chamber of Commerce. Pre-registration is preferred - Purchase tickets online via https://radiusgallery.brownpapertickets.com and select your associated chamber when purchasing your tickets.